Separate area for non-Orthodox prayer is not good enough for the women who want to pray like men. 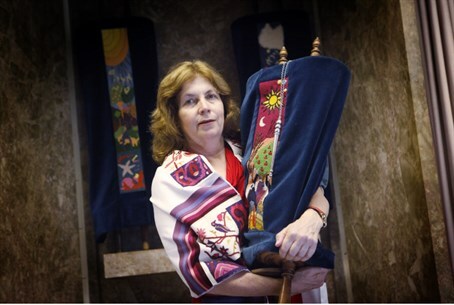 The chairperson of Women of the Wall, Anat Hoffman, is admantly opposed to an initiative by Religions Minister Naftali Bennett, to open a separate area next to the Kotel for non-Orthodox prayer, and to limit her group's prayers to that area. She was quick to denounce the offer almost as soon as Bennett announced it. The separate prayer area has been set up south of the Rambam (Mughrabim) Gate. The Kotel plaza is located just north of the gate. "I respect other people's emotions very much, but I will not be relegated to an alternative offer that is located lower, and there is importance to this,” she said. Women of the Wall are a small group of women who insist on praying in a style that mimics Orthodox men's prayer. They wear a prayer shawl, don tefillin and read from the Torah – in direct contravention of traditional Orthodox custom, in which only men do these things. Bennett – who is also the Economics Minister and Minister Jerusalem and Diaspora Affairs – is hoping to end the conflict between Women of the Wall and the Orthodox stream with the special prayer area that can hold up to 450 people. The new prayer space would be used by the Women of the Wall, while the present women’s prayer section at the Kotel would be used exclusively for prayer that does not violate traditional Orthodox norms. The Women of the Wall formerly had a separate prayer space, but moved to pray at the Western Wall after finding the separate space unsatisfactory. The “new” prayer area is outside the Kotel plaza but still adjacent to the wall. It has been approved as a prayer area alone, and cannot be used for wedding or circumcision ceremonies.